The larvae which are not attended by ants feed on a number of species including Acacia spp., Albizia lebbeck and Cupaniopsis anacardioides. Mature larvae green with a line of black spots and cream blotches, strongly humped. 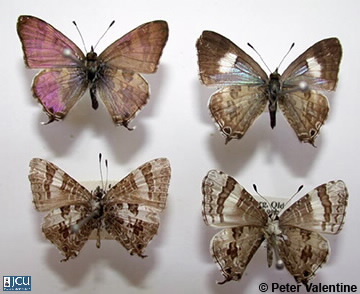 Adult male brown to bluish-purple, narrow brown outer edge, hind with two obscure spots and short tail, female brown-black with shining blue central area and a white patch on the fore wing, on the hind some white rings and a small tail; lower surface basically brown but whitish towards the outer margin, dark brown bands and spots present, prominent dark spot on the hind.